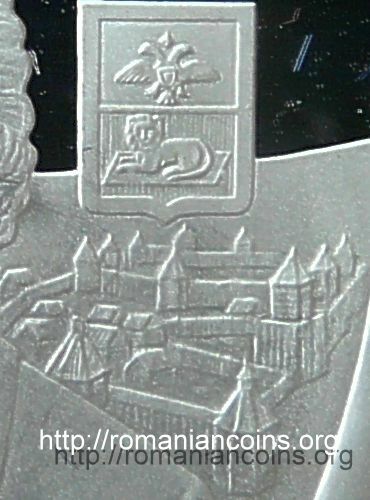 Obverse: denomination "100 RUBLEI" (Cyrillic), coat of arms of the self proclaimed republic of Transnistria (bearing hammer and sickle), inscription "PRIDNESTROVSKII RESPUBLIKANSKII BANK" (in Cyrillic and Russian) meaning "[TRANS] NISTRIAN REPUBLICAN BANK", year 2007, at left mintmarks, at right Ag 925, the silver fineness Reverse: the image of the general, next the Russian coat of arms of the city of Tighina (Bender) and, on a sheet of paper, an image of the fortress of Tighina, inscription "GENERAL - ANŞEF PANIN P.I." meaning "GENERAL IN CHIEF P.I. 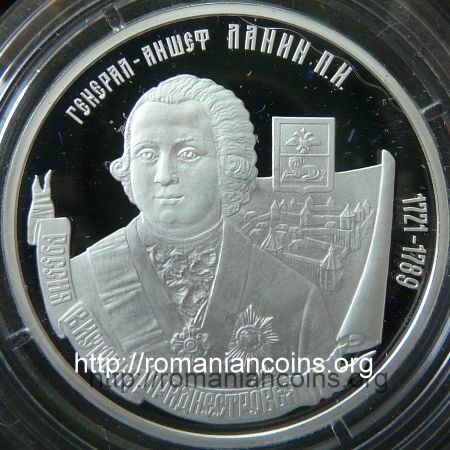 PANIN", years 1721-1789 and, on a ribbon, "ROSSIA V ISTORII PRIDNESTROVIA" (with Cyrillic letters, in Russian), meaning "RUSSIA IN THE HISTORY OF (TRANS)NISTRIA"
The coin belongs to a series named "Russia in the history of (Trans)Nistria". 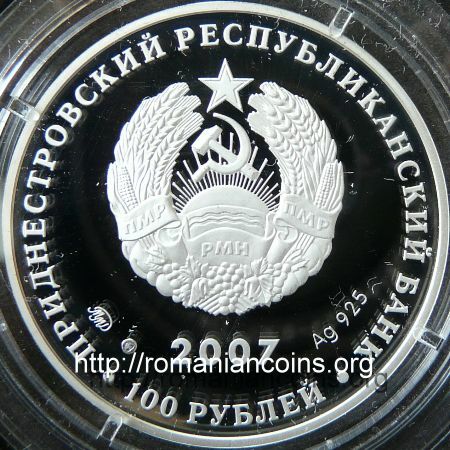 The series also comprises the 100 rubles 2007 coins with field marshal Pyotr Rumyantsev and field marshal Grigory Potyomkin, the 100 ruble 2008 coin with field marshal Peter Wittgenstein and a 5 rubles coin from 2009 with Russian Empress Catherine II. Piotr Ivanovich Panin advanced in the Russian Army over to the rank of "general-in-chief" (from the French général en chef - only two military ranks were higher at that time in Russia - general-field marshal and generalissimus). Panin started his military career in 1735. He fought in the Seven Years' War (1756-1763, when he was already major general), and in the Russo-Turkish War from 1768-1774. In 1760 he participated to the capturing of Berlin. He was senator of the Russian Empire, and in 1767 he also received the rank of count. In 1770, on the 26th of September, he conquered the fortress of Bender (Tighina) from the Turks. In 1774 he commanded the troops sent against the rebel army of Pugachev.